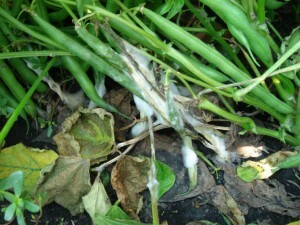 Sclerotinia white mold is caused by Sclerotinia sclerotiorum, S. minor, and S. trifoliorum. Sclerotinia sclerotiorum has a very broad host range (> 170 plant species). 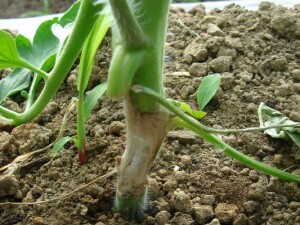 This disease affects a number of economically important high tunnel vegetable crops including tomato, pepper and lettuce. 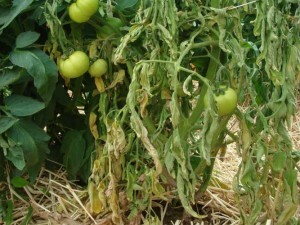 In tomato, the disease is also known as timber rot. Sclerotinia primary infections usually occur on flowers and very succulent tissues. 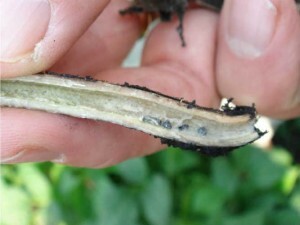 The host crops are most susceptible to infection during flowering, where a white cottony growth forms on all plant parts. However, young seedlings of tomato, pepper and other vegetables produced in high tunnels are also very vulnerable to infection. 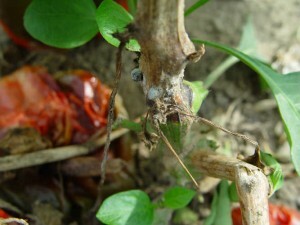 Soft watery rots form on the stems, eventually becoming dry and brittle, which leads to girdling. To prevent Sclerotinia white mold, start with clean soil and frequently sanitize tools and other equipment in the high tunnel. 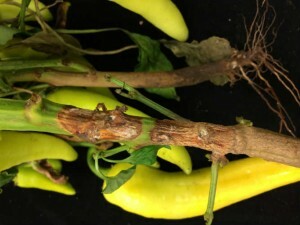 Sclerotinia white mold symptoms on tomato (top left; top center), beans (top right; bottom left), and pepper (bottom center; bottom right).